A lot of people knock the use of fresh ice, but here's the reason why. Fresh ice properly dilutes the cocktail, but at the same token - you keep your cocktail fresh and cold. You really let the aroma sit in when you add in the H20. Not a lot of people realize that. If you are going to really mix or keep your drinks looking fresh, make sure you always put in some fresh ice to keep your cocktails colder for longer. This is very important because a lot of people do not like the taste of straight up alcohol. You have to know what flavors go with others. If it's specific cocktail using a specific liquor, the tasting notes are pretty important to note. For example, I had a drink that combined whiskey and eggnog into one then I added honey liqueur and a bit of coconut rum. The purpose was not just putting this on top of this just make a super sweet drink. No. The purpose was enhancing the flavors based on how each one would combine into a great drink. I knew the whiskey and eggnog would be great in the beginning. The honey liqueur would kick in immediately. Then the coconut would be a great finisher. Every bartender should know the basics: vodka/cranberry, vodka/orange juice, vodka/redbull, whiskey/coke, whiskey/ginger ale, rum/pineapple juice, gin/tonic, etc. However, it's always good to note classic cocktails and shots. Also, keep abreast to some of the new stuff that are becoming popular whether it's a national, regional, or even international thing. This will show your diversity and knowledge as a bartender. You can always do research online, get books, or now even apps on your smartphone. They can also provide you with great tips on what types of liquors go with different mixers. Pour counts are VERY essential. 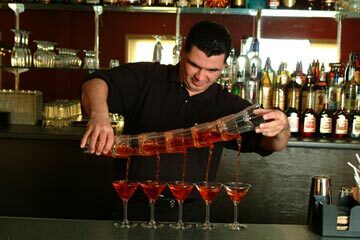 This is a great bartending tip because you don't want to over pour. One thing if you want to be behind the bar, money is a major issue. Owners can calculate how much money they should get from each bottle because they go by the shot or amount poured for a drink. It's good to get your counts together when you use a pour spout. Learn the difference between a short pour and a long pour. Also, if you are just beginning, a jigger may help you out when it comes to learning counts and how to get the proper pour amount. When you have parties, this also comes in handy because you don't want to pour in extra amounts of liquor for the simple fact you will not only use the bottle quicker. You'll also get people a bit too intoxicated quicker. You want to try your best to get people on an even level through time. It's no point in doing it if you don't enjoy it. This should be a very fun activity where you get people together. You enjoy each others company and really take into the festivities whether it's music, a football game, or a nice dance event.